Bob Dylan and rebellion aren’t strangers. It has defined his career. Professor Larry David Smith delivered the Brigance Forum lecture Tuesday night based largely on his research of Dylan’s writing and career. Smith has written about the rhetoric of popular music in society in books featuring Dylan, Elvis Costello, Pete Townshend, Bruce Springsteen, and Joni Mitchell. Even the caricaturized version of Dylan on stage mumbling is part of Dylan’s rebellious act. Smith said that rebellion runs even deeper. "It’s a complete and powerful disregard for the audience," he said. "He didn’t want to be an idol and he didn’t want to be anyone’s spokesperson." Smith said Dylan would purposefully create bad albums during his career to break the stereotype and rebel against expectations. But he resolved the ‘Minstrel’s dilemma’ of pleasing himself or selling records by allowing greatest hits releases throughout his career. Dylan is an iconic figure in pop culture by anyone’s standards, but he has been the most unique and powerful, Smith suggested, by doing it only to please himself. "This artist is not very forthcoming," Smith said, admitting he’s never met the man. "He says what he wants to say and then walks away from it." Not only does he walk away from it, he often disguises it. Dylan is known to frequently recast his greatest hits to nearly unrecognizable arrangements in concert, Smith said. Smith has spent considerable time analyzing Dylan’s lyrics and albums from a critical, rhetorical perspective. He looks at lyrics searching for character, value, and plots for his critiques. Much of his presentation was focused on the rhetoric Dylan used to attain his success and then to distance him from what he had achieved. Smith even offers a three-part definition of the man: Robert Zimmerman, Bob Dylan, and the current incarnation ‘Jake Fate.’ He chronicled the various phases of Dylan’s career from folk icon, to country, to pop icon and beyond. The Brigance Forum is an annual public lecture or debate endowed by the Brigance family, friends, and former students in memory of the late William N. Brigance. 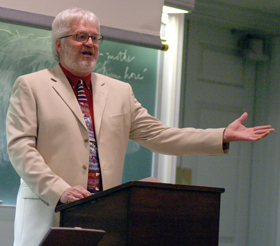 During his time as a Wabash professor and chairman of the Speech Department, he fostered a desire in students to be more effective in their speaking.